Spa: The Spa/Health Club with a large indoor swimming pool is magnificent, with a cathedral ceiling and windows overlooking the mountain. The Spa area offers also: sauna, whirlpool, massage, Vichy therapy body treatment rooms. 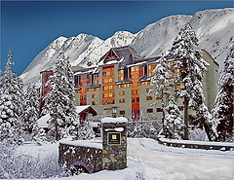 Restaurants: The Seven Glaciers, 2,300 feet above the lobby by tram on Mount Alyeska, serves trendy and beautifully presented dinners. This restaurant opens only on the weekends in the winter. A mountaintop cafeteria is right next-door (great views, limited choices). At the base level, the Japanese cuisine at the Katsura Teppanyaki has developed a excellent reputation. The Pond Cafe provides a nice view. The Sitzmark Grill features live music and some good fast food. 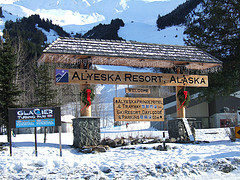 The Day Lodge is a cafeteria style restaurant and located on the base of Alyeska's slopes. 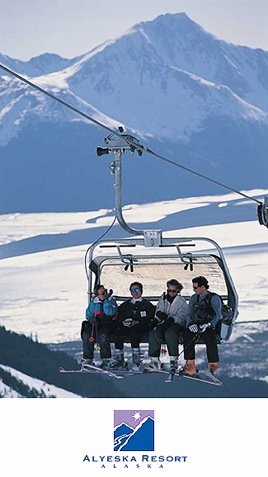 Other & Activities: two bars, concierge, tour desk, business center, shopping arcade, babysitting, wireless internet access, ski and snowboard rentals. Sled dog tours, helicopter skiing, snowshoeing, x-country skiing and other winter activities are available. The entire Hotel provides a non-smoking environment. Rooms: 304 non-smoking rooms and suites (upgrades available). Each room consists of either two double beds or one king bed with comfortable "presidential" SERTA pillow top mattresses. 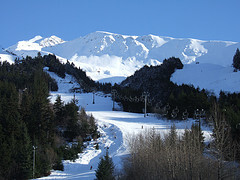 The rooms are furnished with a color cable television, refrigerator, in-room coffee maker with a large Starbucks Coffee selection, complimentary bottled water, DSL and WIFI internet access, in-room safe, MP3 clock radio, locking ventilated ski boot storage, heated towel rack, hairdryer, make-up mirror, bathrobes and slippers, voice mail messaging, bathroom telephones, native Alaska artwork and high speed internet access. The hotel has 17 special needs accommodation rooms. These rooms also provide a non-audible strobe alarm for hearing impaired customers. Room service is available from 7:00 am - 11:00 pm The menu features a wide selection of traditional Alaska dishes and an extensive wine selection.